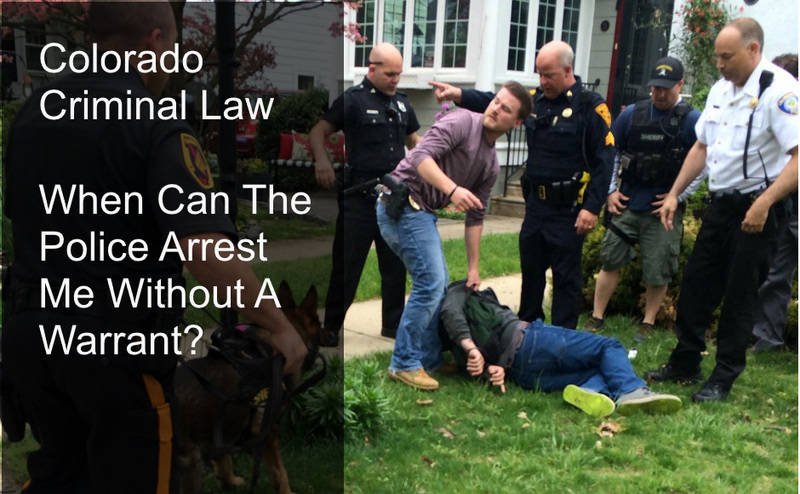 Colorado Criminal Law – When Can The Police Arrest Me Without A Warrant? One of the most frightening and least understood experiences in our lives can be being placed under arrest. One way to understand and to fully employ your fundamental Constitutional rights is to understand the methods and procedures used by the police to arrest you under Colorado law. This article outlines the extent of the limits of the Colorado police power to arrest. An arrest is seizure or forcible restraint. An arrest is an exercise of the government’s power to deprive a person of his or her liberty. It is the taking or keeping of a person in custody by legal authority, typically in response to a Colorado criminal charge. While individuals can be taken into custody for many reasons, the Government must bring the arrestee before a Court or otherwise secure the administration of the law. An “investigatory stop” or “detention” is not legally considered to be an “arrest.” By definition it must be limited and temporary. It can last no longer than necessary to carry out the purpose of the stop or detention. An investigatory stop that continues for too long becomes a de facto arrest. If and when that happens, the arrest must comply with the warrant requirements of the Fourth Amendment. When Can A Colorado Police Officer Make An Arrest? Probable Cause – There is probable cause to believe that an offense was committed by the person to be arrested. The police may arrest persons outside their jurisdiction (but within the State of Colorado) for felonies and misdemeanors that are being, or have been committed, in the presence of that police officer. When this situation happens – the “out of jurisdiction” police officer will notify the local law enforcement agency that has jurisdiction over the location and then release the arrested person to the custody of the local law enforcement agency. The out of jurisdiction officer will then complete a report that is used by the local law enforcement agency in completing their investigation. When? -The law permits an arrest to be made on any day of the week and at any time of the day or night. How Much Force? The Law allows the police to use all necessary and reasonable force when making an arrest. Entry Into A Property – The Law also allows the police to use all necessary and reasonable force to gain entry into any building or property or part thereof to make an authorized arrest. When Can The Police Stop A Person? The person’s proof of insurance. An explanation of the person’s actions (such as where they are coming from or going to). While the person does not have to reply, the law does not constitute an arrest. C.R.S. 16-3-103. When Can The Police Conduct A Frisk Of A Person That Has Been Legally Stopped? Colorado law allows the police to “frisk” you if you have been stopped for questioning when there is evidence of risk to his or her personal safety…that is that the office reasonably suspects that the officer’s personal safety requires it. Only then may the officer conduct a limited search, or “frisk” by patting down your outer clothing for weapons. If officer’s frisk reveals what feels like a weapon, the officer may search for and remove the item from your clothing. If, and when, the frisk reveals an illegally possessed weapon, the officer may then arrest that person and conduct a full search of the person and the immediate area within the person’s reach. Does The Person Have A Right To Know WHY They Are Being Arrested? Yes – A person has the right to know for what he is being arrested, and to be advised of his rights when that is required, the advisement under Miranda IF the police intends to question the person arrested. H. Michael Steinberg welcomes your inquiry and do not charge for initial telephone consultations. H. Michael works hard to get his clients the best possible results in and out of the courtroom. 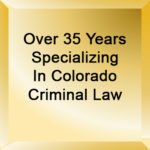 He has written, and continues to write, extensively on Colorado criminal law and he hopes this article helps you in some small way – Colorado Criminal Law – When Can The Police Arrest Me Without A Warrant? Colorado Criminal Law - When Can The Police Arrest Me Without A Warrant? One of the most frightening and least understood experiences in our lives can be being placed under arrest. One way to understand and to fully employ your fundamental Constitutional rights is to understand the methods and procedures used by the police to arrest you under Colorado law.